How much is video production? | DigitalHipster Inc.
One of the most powerful things you can do for your website is to have a professionally produced video. You are far more likely to show up in Google Search on page one if you have a video. If your competitor has a website with a video and you do not, they are far more likely to show up on the first page of Google Search for their category than someone who does not have a video. Why? Content is King on the Internet and Google Search is starved for video in many niche categories. You can make your own video for just the investment of your time and a couple bucks for a camera, or you can have it professionally produced. There is a wide range of expertise and quality when it comes to video production. Below are two examples of video production. The first was shot outdoors using a consumer grade camera and shot in one hour without the use lighting or a proper microphone. The second video was shot on a Professional Grade Panasonic P-2 with proper three point lighting and includes graphic overlays, music treatment and several hours of editing. Planning for the day of filming– You want to make sure you don’t go back to edit and realize you didn’t get that one shot that you needed for for your TV commercial. A good video production company or videographer will help you establish storyboards if needed and a proper timeline or scheduled time for each shot. This should include setup time and shoot time. 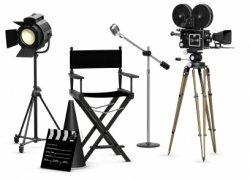 Common mistakes beginners make is not allowing for setup time when they are shooting multiple locations. Even changing from one room to the next can add another 15-30 minutes for setting up the lighting. What if you planned for the last shot to be a beautiful sunset, and you miss it? It’s best to know exactly where and what you will be shooting prior to the day of filming. Setup– Is there a tree coming out the back of your subject’s head? Does the sun come up in the windows behind your subject? Yes, the view may be great in their boardroom, but if it causes them to look like a shadow figure there’s a better shot. Lighting– You need to have proper three-point lighting for most indoor shots. There is nothing worse than having a subject look like a deer in headlights or a mysterious ghost effect or Fight Club looking room. A Professional-Grade video camera– Your video camera is the lowest common denominator when it comes to the quality of video produced. Good video editing– The best video shot always looks better when the transition between shots and timing is right. Did you get rid of all the “ums,” but now your subject sounds like Siri? The kind of video production you should expect from a professional videographer or video production company in the greater Akron or Cleveland area in the $800 to $5,000 range depends on the specifics production requirements such as number of setups, complexity of graphic treatments, and length of the final video. Hopefully, you can see a clear difference in the production quality and appreciate the value of the following video versus the previous one. About Us: We do not charge travel time for Northeast Ohio including Akron, Canton, and Cleveland. We offer TV Production Quality Video shot on a Professional Grade camera. See more examples of our video production here.